Easily told by long, narrow wings, distinctly angled when gliding, white under-surface with black carpals and band through centre of underwing, white crown and dark eye-mask. Variable dusky band across fore-neck (usually boldest in female). Juvenile has whitish scales and white line on greater coverts above. 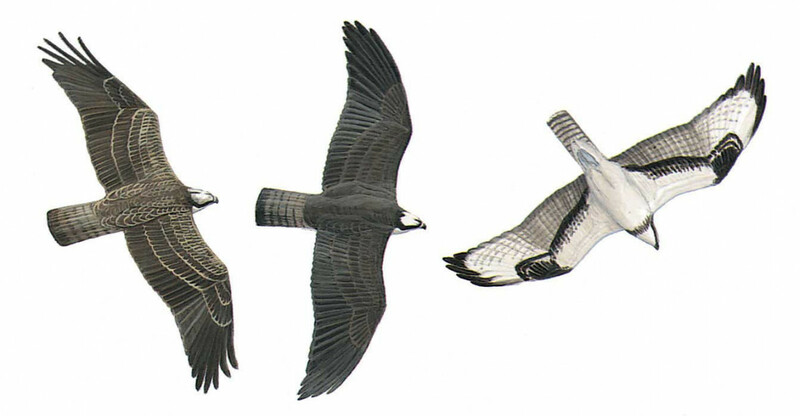 Flies with very steady shallow wing-beats, glides on smoothly curved wings; may recall large soaring gull at distance. Hovers over water persistently for fish and dives with splash, almost disappearing.